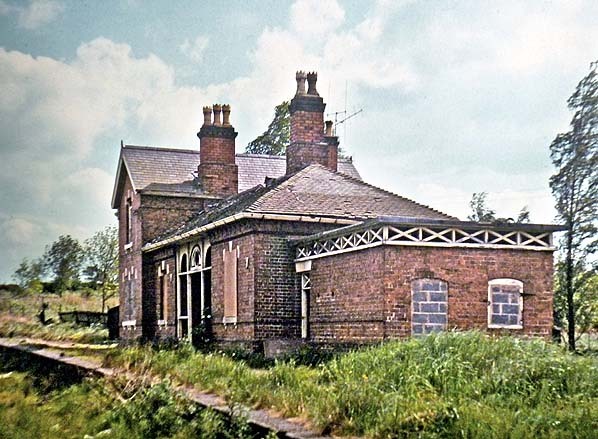 Notes:The Halesowen & Bromsgrove Branch Railway (H&BBR) was incorporated on 5 July 1865 to construct a 6-mile line from Halesowen Junction on the Midland Railway (MR) Bristol & Gloucester route to form an end-on connection with the Great Western Railway (GWR) Halesowen Branch. A second branch was also authorised to make another connection with the MR near Longbridge, likewise on the Birmingham to Gloucester line. By 1870 the company had run into financial difficulties so, realising that the plans were too ambitious, an application was made to Parliament for the connection with the Midland at Bromsgrove to be abandoned; this was authorised on 1 August 1870. Building of the line had yet to begin as the H&BBR was unable to find a contractor willing to take on the financial burden of construction. On 13 July 1876 the H&BBR assumed the title of the Halesowen Railway (HR) and construction of the first section of the line began. Prior to this, on 30 July 1872 a working agreement was drawn up between the HR, GWR and MR for the two companies to operate the line jointly and for the HR to construct a station on the MR at Northfield. The completed line was inspected by the Board of Trade in August 1881 and was found to be unsatisfactory; following modifications it was passed for use in May 1882. 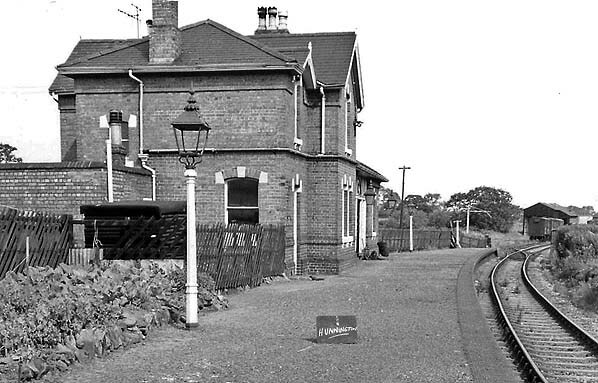 Sadly the line did not open immediately as a dispute between the HR and the MR developed owing to the former not completing building work at the station at Northfield, as was part of the working agreement. With the dispute settled the line finally opened on 10 September 1883, over a year since it was passed for use. A celebratory public breakfast was held at the Shenstone Hotel on 1 October 1883. The GWR and MR operated the line for 50% of gross receipts for the next 20 years but by the early 1900s the HR was in financial difficulty. In 1904 the HR was declared bankrupt, and following this the company was jointly vested in the GWR and MR on 1 July 1906. The station at Hunnington opened on 10 September 1883 and was constructed in a distinctly MR style incorporating a two-storey house and single-storey office range. The red brick house was built on a ‘T’ plan with a hipped roof, and gabled projections were on the platform and exterior elevations; an additional small gable faced the platform. The office range was under a hipped roof. The station house windows had segmental arches enlivened by a pale coloured keystone and side stones as well as cills which contrasted with the red brick. The new service was advertised via handbills naming it as the Halesowen and Northfield Railway. Initially there were seven services in each direction on weekdays with no Sunday service. Of these seven services, three ran from Halesowen through to King Norton, three from Halesowen to Rubery, and one service ran through to Birmingham New Street; the same was true for trains operating in the opposite direction. By December 1895, Bradshaw shows that the Halesowen to Rubery service had been discontinued but the Halesowen to Kings Norton provision had increased to five services each way on weekdays; again there was no Sunday service. With the construction of the Austin motor car works near Longbridge in 1905, passenger loadings along the line increased, ferrying workers to and from the plant. By 1913 the workforce had grown to around 2,300 employees and by the end of World War 1 it had swelled to 22,000. Even with the increase in passenger numbers the general passenger numbers never reached acceptable levels and in April 1919 the MR withdrew the passenger service between Halesowen and Kings Norton. It was the GWR who introduced a daily workmen’s service each way between Old Hill and Longbridge. In 1905 the Austin Motor Company opened a new car plant at Longbridge. By 1913 the workforce had grown to around 2,300 employees and by the end of the First World War it had swelled to 22,000. In 1915 the first sidings were laid at the plant and the MR and GWR obviously saw the increasing workforce as a chance to increase passenger revenue along the branch. A new station was constructed in the MR style. Even with the increase in use the general passenger numbers never reached acceptable levels, and in April 1919 the MR withdrew the passenger service between Halesowen and Kings Norton. It was the GWR who introduced a daily workmen’s service each way between Old Hill and Longbridge this unadvertised service called at Hunnington. When the railways were nationalised on 1 January 1948 the Halesowen Railway was allocated to British Railways (BR) Western Region, but in a boundary adjustment on 1 February 1958 it was transferred to London Midland Region administration. Private motor vehicle ownership rapidly expanded during the 1950s, and with demand for its train services declining BR announced that the workmen’s trains would be discontinued on 29 August 1958. Representations from Birmingham City Council over the issue of the withdrawal had a limited effect, with the Birmingham New Street to Longbridge being retained temporarily. So, on 29 August 1958, the final Longbridge to Old Hill service departed with the service being fowmally withdrawn on 1 September 1958, with the Birmingham New Street services finally ending on 2 January 1960. The council placated inconvenienced passengers with the assurance that the ‘improvements in bus services adequate to cover the workers’ needs’. 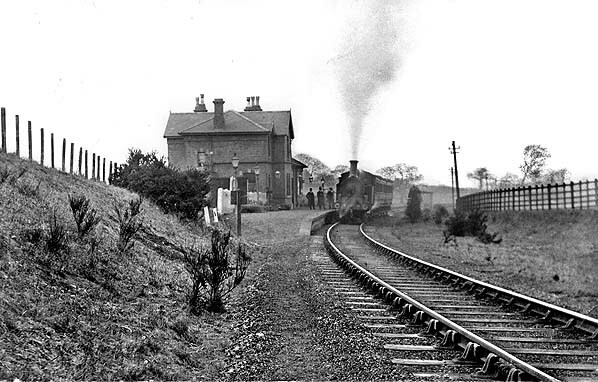 The station was provided with a small goods siding and weighbridge from its opening, and these facilities would expand to include further sidings and a goods shed. Expansion of the goods facilities took place in the early 1930s when a factory was opened on the opposite side of the Bromsgrove Road by Henry Vincent. His company was to become Blue Bird Toffees, and the factory he built was based around the Cadbury philosophy of a pleasant working and home environment making for happy workers. This provided more traffic for the small goods yard as raw materials were brought in and the finished product shipped out. Goods services continued along the line until being withdrawn on the Halesowen to Rubery section on 6 January 1964, the final train having run on 4 January. The station building was left unused from 1964, until purchased in 1976 in a sealed bid auction. 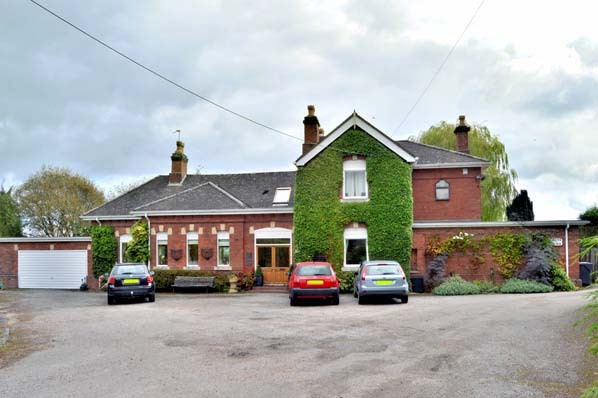 The new owner set about converting the now semi-derelict, but substantial, building into a family home. 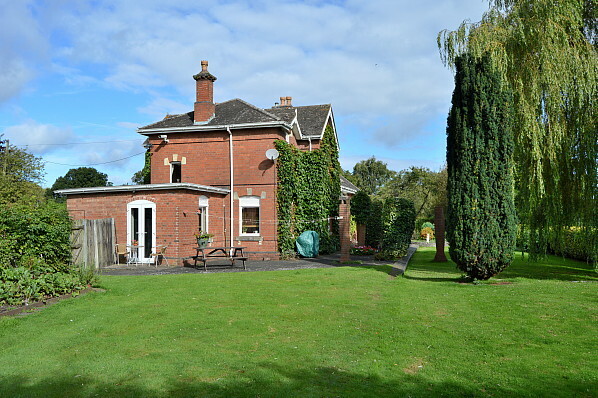 The owner and his young family lived in a caravan on site whilst the conversion took place and within 12 months they were able to move into the former station building. Both internally and externally the layout has changed little since it was an operational station; the major alteration to the frontage was the re-positioning of the front door and the creation of three windows with the former toilets and/or storeroom being converted into a large garage. The former trackbed through the station was in-filled, but the typical MR platform edging stones were retained with the platform area itself being converted into a patio. 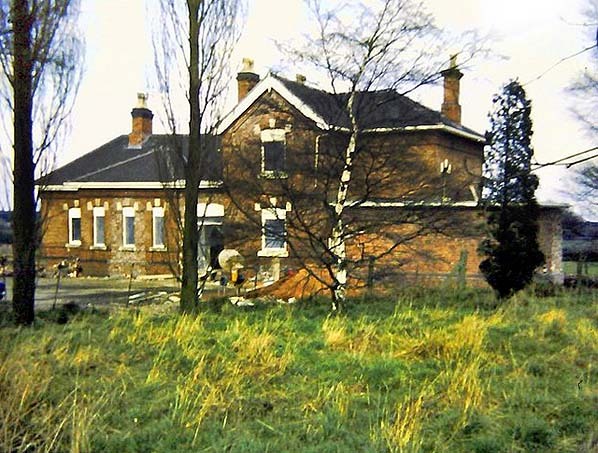 The private residence is located along a private road from the Bromsgrove Road and stands as the only surviving example of any of the stations from Halesowen through to Longbridge. In April 1909 a southbound service is captured at Hunnington with what appears to be station staff in attendance. prior to the goods yard being developed. By the 1937 1:2500 scale map was completed the area around the station had changed the Bluebird Toffee factory can be seen to the left of the A459 road with a Post Office opposite. A recreation ground omplete with cricket pavillion has been laid out to the south-wet of the station by the owners of the factory. Railway wise the goods shed had been erected and a weighing machine can be seen in the goods yard, denoted by WM initials extra sidings have also been provided due to the increase in traffic that the factory has created. 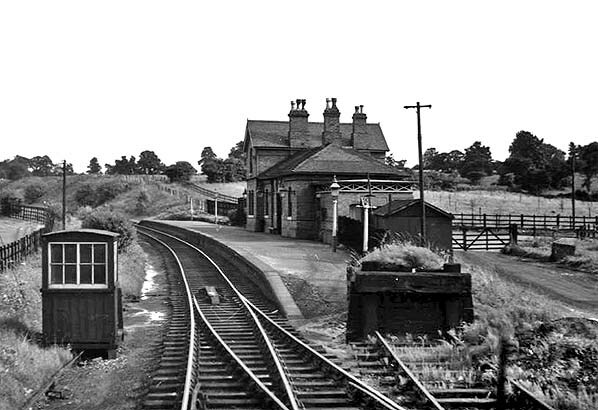 Looking south at the station site in July 1953 the rudimentary stop block of the goods yard and the minature signal box controlling the entrance to the goods yard are worthy of note. 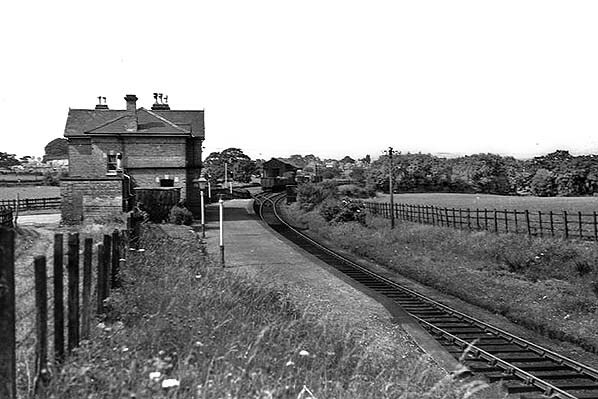 Looking towards Halesown from the southern end of the station in July 1953 the platform and buildings are in remarkable condition as it is nearly 35 years since the final timetabled passenger service called here. The goods yard to the north of the station still remains busy. Looking north in the 1960's at the substantial Midland Railway building the platform garden is still tended to and the goods yard has some 4 wheeled vans stabled, probably in connection with the local Blue Bird toffee factory. The two wall mounted lanterns mark the access from the waiting room to the platform. Looking south at the station building some 17 years after closure the lanterns between the waiting room access have been removed and the platform is very overgrown. Looking from the Blue Bird factory cricket pitch in July 1977 with the conversion into a family home in full swing. The original entrance is marked by the fresh brickwork between the two trees on the left with the new entrance just visible to the left of the cement mixer. Looking at the station frontage from a similar angle to the previous picture the new brickwork around the former entrance has blended in perfectly with the passage of time. It is worthy of note that the garage extension to the left has been provided with a pale coloured keystone and side stones replicating the feature of the original building. Looking north at the rear of the building from a simialr angle of the J L Smith picture part of the platform edge can be made out with the trackbed area having been landscaped to create a plesant garden. Interestingly and completely by chance the visit to Hunnington was made on the 56th anniversary of the final workmens train along the branch.